Concerts at The Ivy House | The Goose Is Out! This page is for information which applies to all our concerts. Click here for information about specific concerts and other events which are coming up! 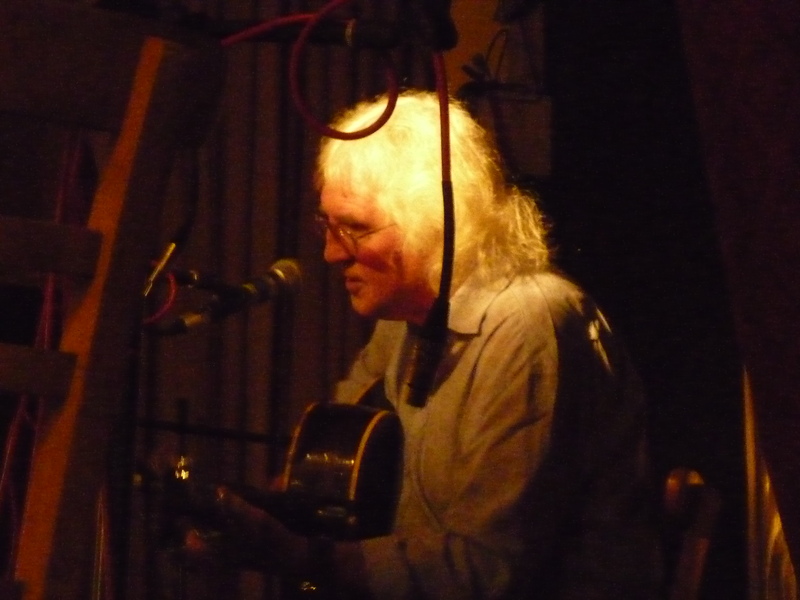 Our concerts at The Ivy House are normally on the last Friday of the month (except July, August and December, when we don’t have concerts) but this may occasionally vary, for example if that Friday is a Bank Holiday. 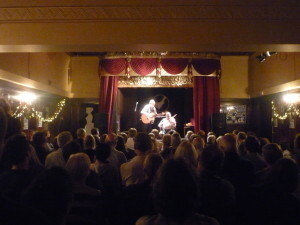 They are held in the big room at the back of The Ivy House, with the stage and the fancy curtains! Doors open at 7pm (but see the note at the bottom of this page) and you can have a drink while listening to our resident Big Chill DJ Folk2Future (aka DJ FlapJackDavey aka Nygel!) – or occasionally a special guest DJ! 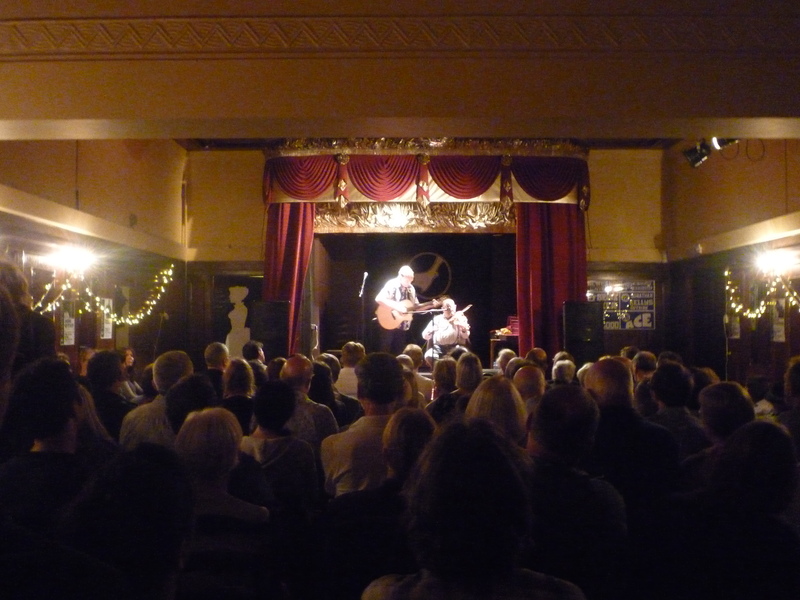 The lovely Ivy House is a pub – not a theatre! There will be half seated and half standing room, with the seating at our concerts usually being chairs in rows. Seats are not reserved, so to be sure of a seat in a position you prefer (or in some cases a seat at all) you should come early. PLEASE NOTE! We cannot guarantee a seat if the event is very popular and you arrive after the advertised door opening time, although there will be standing space available until we jreach the room capacity. 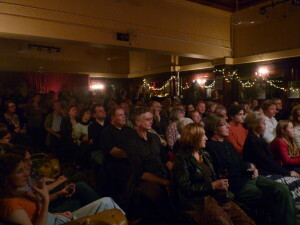 We CANNOT bring seats into the room from other parts of The Ivy House once the door has opened at 7pm. If you must have a seat for health or other reasons, please ensure that you arrive at 7pm. If for some reason that is not possible, please contact us IN ADVANCE OF THE DAY and we will do our best to help. If you have already bought a ticket, you are of course guaranteed entry. If you haven’t, if the event is very crowded unfortunately we may have to turn you away, so we do recommend wherever possible that you buy your ticket in advance. This order and the timings may occasionally vary if there are circumstances outwith our control. It will also vary if we have joint headliners. We do our very best to open the doors at The Ivy House at 7pm. This isn’t always possible as sometimes musicians are late for their sound check, or there are other circumstances beyond our control. We take the view (and we hope you do too) that you would rather we had a thorough soundcheck to make the sound as good as we can than cut corners to let you in bang on the dot of seven. Please understand that for various reasons the vast majority of artists are not happy to have members of the audience sitting in on their soundchecks, so that is why we cannot let you in during the soundcheck. Sorry! Please also understand that we will have been at the venue for a long time before the door opens in an effort to make the evening as good as possible for our audience, so if you have to wait a little longer than 7pm to get in, please don’t take it out on us! Please note that during our concerts and club nights, you will not be able to access the ballroom (where our nights are held) from the refectory, EVEN IF YOU HAVE BOUGHT AN ADVANCE TICKET . If you are already in the refectory, please use the garden door and go round the side of the pub to access the ballroom and the ticket/handstamp table from the front bar. We are sorry for any inconvenience caused, but unfortunately we have had problems in the past with people using this door to avoid payment, and we can no longer have somebody there every night checking handstamps. We aim to finish the second headlining set at 11pm, although for various reasons such as hideous technical issues this may not always be possible. Also, there will usually be encores which extend the live music beyond 11pm. For details of transport home, including a night bus which stops nearby, see our find us page. 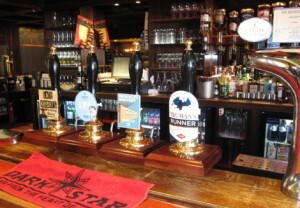 A choice of real ales (both draught and bottled) is available, plus good pub grub! Sorry, but you will not be able to eat your food in the ballroom. You are very welcome to come in when the door opens at 7pm, save a seat and then eat in another part of the pub. If you do not want to do that, then please make sure that you arrive in sufficient time to order and eat your meal before the door opens. You can also phone The Ivy House in advance to reserve a table to eat in one of the other rooms. We did trial eating in the ballroom prior to the live music starting, but for various reasons this did not work. Sadly, we now have to add here what surely should be obvious to everybody – PLEASE do not hold conversations with your friends during the live music. This is both disrespectful to the artists and disturbing to other people who are trying to listen. Obviously some essential things may have to be said. That is a different matter to continuing to talk about non-essential things, particularly after you have been asked to stop. 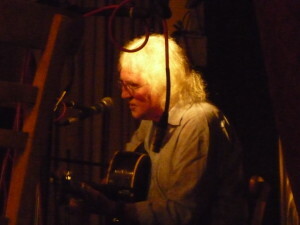 In future, people who persistently talk during the live music will be asked to leave the gig, and will not be refunded. Would you Like to Perform at a Goose Concert? If you would like to perform at The Ivy House, please click here for details!